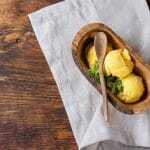 This Easy Mango Vegan Ice Cream Recipe is made using coconut milk and fresh or frozen mango. It’s a healthy and super delicious dessert that everyone will love. Going dairy-free doesn’t mean you have to give up ice cream. 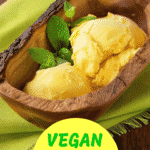 I’ll show you how easy it is to make homemade vegan mango ice cream in this post. I originally posted this vegan ice cream recipe last summer, but I’ve updated it based on the heat wave we’ve been having here in California. Because, heat wave means ice cream, right? You know me, though, I had to make a dairy-free version with a healthy twist. I started with fresh mangos (you can use frozen mango chunks, too). 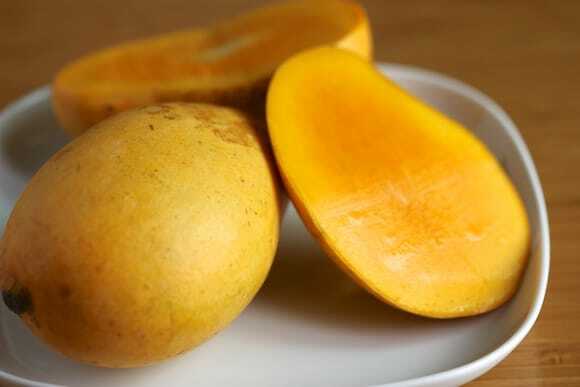 Yellow mangoes are known to be especially sweet and creamy. 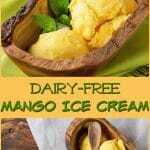 While I used fresh mangos in this vegan ice cream, you can use frozen mango chunks too. 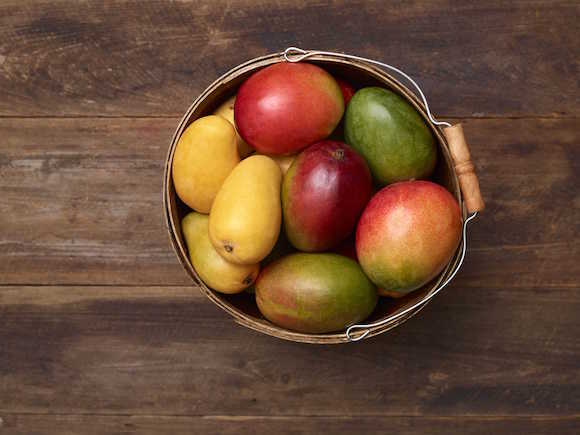 Because of their high soluble fiber content, mangoes give an incredibly smooth texture to dairy-free smoothies and ice creams. 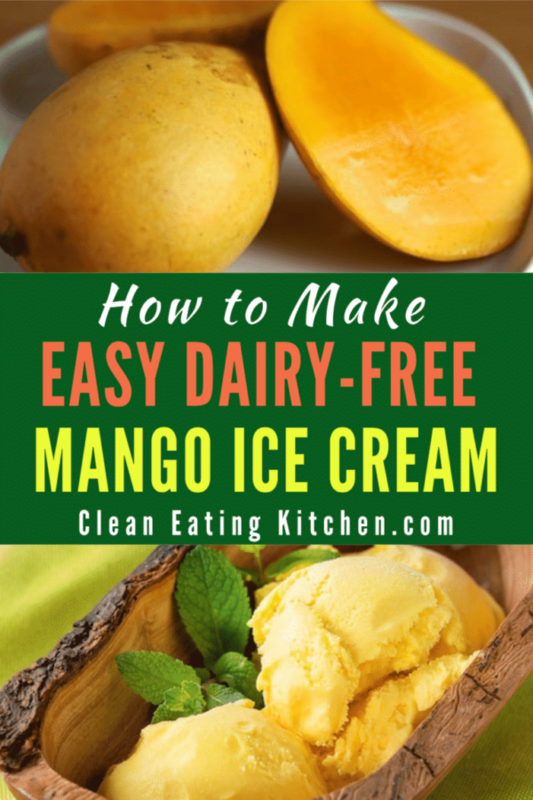 So, while you can certainly eat mangoes out of hand for a healthy snack or dessert option (click here to learn how to cut a mango), I thought it would be fun to create an easy four-ingredient mango vegan ice cream recipe for summer. All you need are mango chunks (fresh or frozen), coconut milk, maple syrup, and vanilla. That’s it! 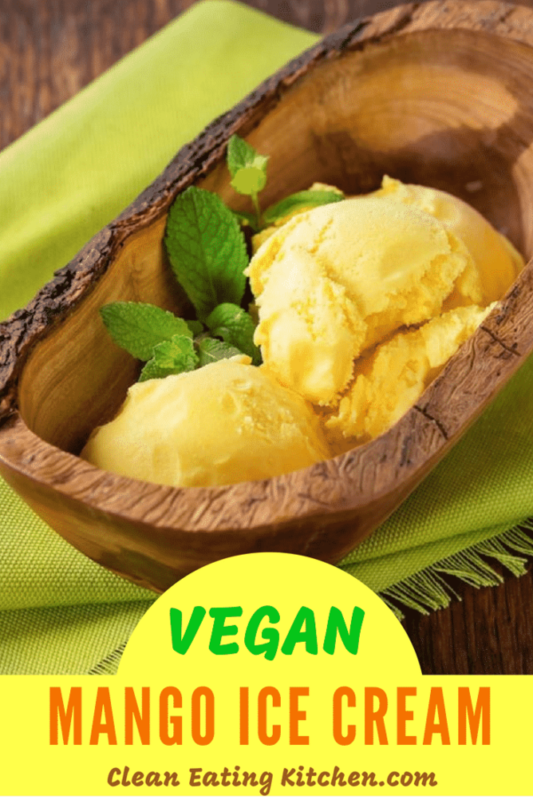 This is such an easy vegan ice cream recipe that highlights both the sweet natural flavor of the mango, highlighted with vanilla beans scraped from the pod. If you don’t have a fresh vanilla pod, you can also use vanilla extract. The ingredients for this vegan ice cream recipe just get blended together and then put through an ice cream maker (alternatively, you can use the freeze and stir method to create a creamy texture without an ice cream maker). Either way, you’ll end up with a healthy vegan ice cream that is perfect for celebrating summer and for a temporary reprieve from the heat. Going dairy-free doesn’t mean you have to give up ice cream! This version is made using coconut milk, with fresh or frozen mango chunks, and maple syrup to sweeten. This is a healthy and refreshing dessert that everyone will love. 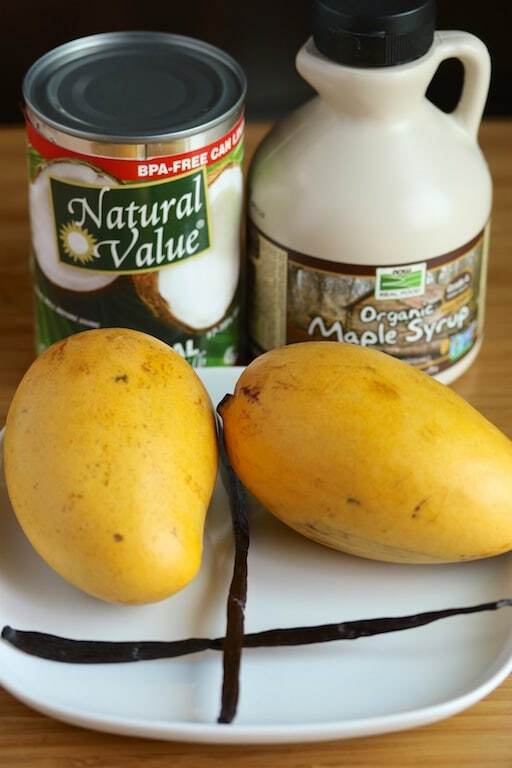 Place the can of coconut milk in the refrigerator until chilled thoroughly.Combine coconut milk, vanilla, mango, and maple syrup in a blender and process until smooth. Pour the mixture into the base of an ice cream maker and freeze according to the manufacturer’s instructions. Carrie; I had all the ingredients for the mango ice cream and so I tried it yesterday and loved it. So easy for something so good and healthy. Great, Judy!!! Did you use an ice cream maker to churn it? I did use the ice cream maker to churn it because I was able to borrow one from a friend. Oh great! That is the best way to get a nice consistency. Glad you enjoyed! This looks amazing – Can’t wait to try it out this Summer!! Love this recipe. I make mango ice-cream just about the same recipe except I use the organic frozen mango – its hard to find fresh organic ones where I live. But this is such a refreshing, cooling, tasty and healthy ice-cream especially for the summertime heat. Thanks for sharing on Real Food Fridays. Pinned & tweeted! Oh my goodness, Marla, what an honor. Thank you!!! I can’t wait to see the post. I’ll be sharing it with my crowd. XOXO! Oh yum… I love mango and vanilla together, plus the coconut milk would make it incredibly creamy! Yum! Mangoes are my favorite fruit and this look soooo refreshing and delicious! I will definitely be making this one. Love all that real vanilla bean! I jus picked up some mangos last week and I think I might have to make this! YASSS Mango Ice Cream! That sounds so perfect right now for the summer! Oh wow, there couldn’t be a more perfect ice cream recipe for my boys! Aka the mango fiends. I know what I’ll be making soon! 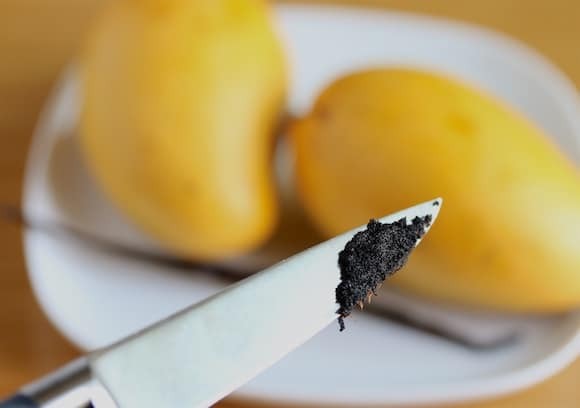 Mango is my favorite summer fruit. Love this easy and dairy free version. Thank you ! Just love ripe mangoes! This looks so good and creamy! This looks so delicious, I’m going to go pick up some mangoes now!! 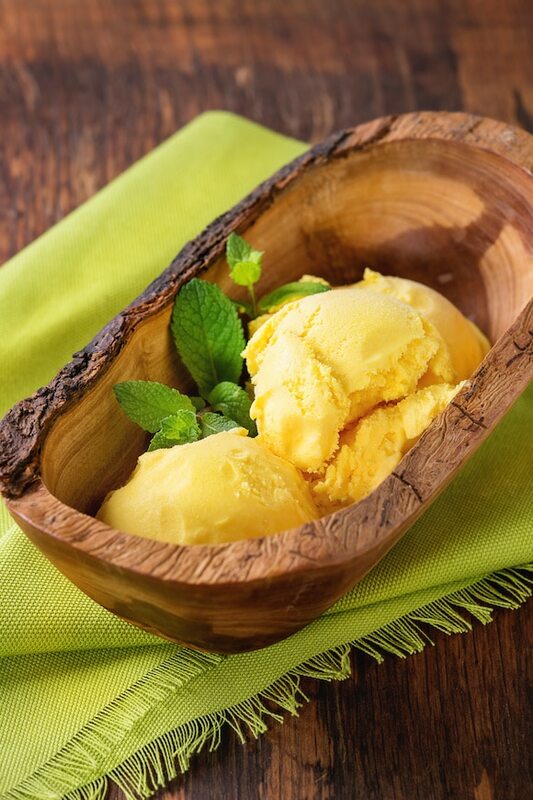 Mango icecream is a summer must! I can taste it already! So yumm! Just made this for dessert. Big hit with the fam. Thank you! I just looooove ataulfo mangos. This ice cream looks totally dreamy! This sounds so refreshing! I wish a had a bowl of this deliciousness for dessert tonight. I don’t have an ice cream maker – any other suggestions for those with minimal equipment? Wow, this looks so fresh and fun. I love that you add coconut milk to make it creamy. 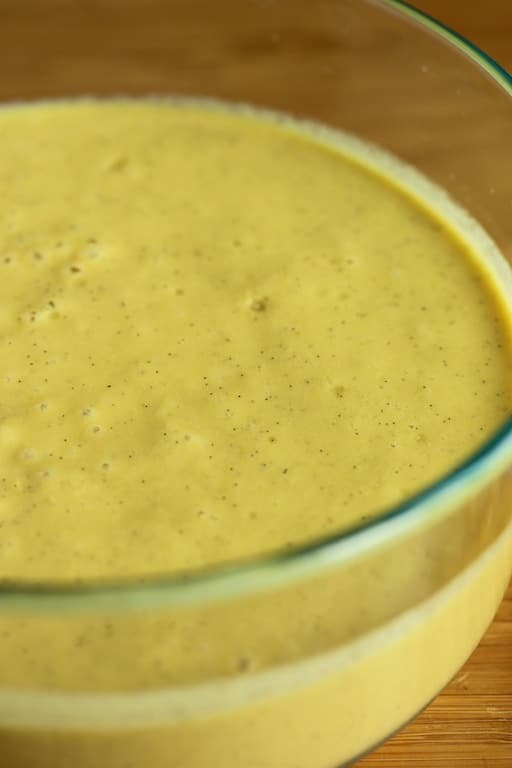 I would recommend combining the ingredients in the blender, then chilling after, as blending them will heat them up. How many ml does this recipe make?